Tab on a wing, used to stabilise racecars, helicopters etc. A gurney flap shown on the underside of a Newman airfoil (from NASA Technical Memorandum 4071). The Gurney flap (or wickerbill) is a small tab projecting from the trailing edge of a wing. Typically it is set at a right angle to the pressure-side surface of the airfoil and projects 1% to 2% of the wing chord. This trailing edge device can improve the performance of a simple airfoil to nearly the same level as a complex high-performance design. It is named for its inventor and developer, American race car driver Dan Gurney. The "variable-lift airfoil" shown in Figure 1 of the 1935 E. F. Zaparka patent U.S. Patent Re19,412. It is a movable microflap, similar to the fixed Gurney flap. The original application, pioneered by American automobile racing icon Dan Gurney (who was challenged to do so by fellow American racer Bobby Unser), was a right-angle piece of sheet metal, rigidly fixed to the top trailing edge of the rear wing on his open-wheel racing cars of the early 1970s. The device was installed pointing upwards to increase downforce generated by the wing, improving traction. He field-tested it and found that it allowed a car to negotiate turns at higher speed, while also achieving higher speed in the straight sections of the track. The first application of the flap was in 1971, after Gurney retired from driving and began managing his own racing team full-time. His driver Bobby Unser had been testing a new Gurney-designed car at Phoenix International Raceway and was unhappy with the car's performance on the track. Gurney needed to do something to restore his driver's confidence before the race and recalled experiments conducted in the 1950s by certain racing teams with spoilers affixed to the rear of the bodywork to cancel lift (at that level of development, the spoilers were not thought of as potential performance enhancers, merely devices to cancel out destabilizing and potentially deadly aerodynamic lift). Gurney decided to try adding a "spoiler" to the top trailing edge of the rear wing. The device was fabricated and fitted in under an hour, but Unser's test laps with the modified wing turned in equally poor times. When Unser was able to speak to Gurney in confidence, he disclosed that the lap times with the new wing were slowed because it was now producing so much downforce that the car was understeering. All that was needed was to balance this by adding additional downforce in front. Unser realized the value of this breakthrough immediately and wanted to conceal it from the competition, including his brother Al. Not wanting to call attention to the devices, Gurney left them out in the open. To conceal his true intent, Gurney deceived inquisitive competitors by telling them the blunted trailing edge was intended to prevent injury and damage when pushing the car by hand. Some copied the design and some of them even attempted to improve upon it by pointing the flap downwards, which actually hurt performance. Gurney was able to use the device in racing for several years before its true purpose became known. Later, he discussed his ideas with aerodynamicist and wing designer Bob Liebeck of Douglas Aircraft Company. Liebeck tested the device, which he later named the "Gurney flap" and confirmed Gurney’s field test results using a 1.25% chord flap on a Newman symmetric airfoil. His 1976 AIAA paper (76-406) "On the design of subsonic airfoils for high lift" introduced the concept to the aerodynamics community. The Gurney flap was the first aerodynamic development made in automobile racing that has been transferred to aircraft engineering. Gurney assigned his patent rights to Douglas Aircraft, but the device was not patentable, since it was substantially similar to a movable microflap patented by E. F. Zaparka in 1931, ten days before Gurney was born. Similar devices were also tested by Gruschwitz and Schrenk and presented in Berlin in 1932. The Gurney flap increases lift by altering the Kutta condition at the trailing edge. The wake behind the flap is a pair of counter-rotating vortices that are alternately shed in a von Kármán vortex street. In addition to these spanwise vortices shed behind the flap, chordwise vortices shed from in front of the flap become important at high angles of attack. Gurney flaps have found wide application on helicopter horizontal stabilizers, because they operate over a very wide range of both positive and negative angles of attack. At one extreme, in a high-powered climb, the negative angle of attack of the horizontal stabilizer can be as high as −25°; at the other extreme, in autorotation, it may be +15°. As a result, at least half of all modern helicopters built in the West have them in one form or another. 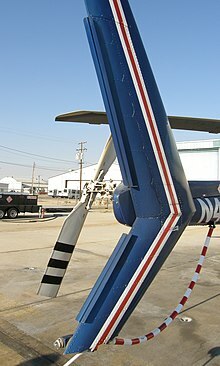 The Gurney flap was first applied to the Sikorsky S-76B variant, when flight testing revealed the horizontal stabilizer from the original S-76 not providing sufficient lift. Engineers fitted a Gurney flap to the NACA 2412 inverted airfoil to resolve the problem without redesigning the stabilizer from scratch. A Gurney flap was also fitted to the Bell JetRanger to correct an angle of incidence problem in the design that was too difficult to correct directly. The Eurocopter AS355 TwinStar helicopter uses a double Gurney flap that projects from both surfaces of the vertical stabilizer. This is used to correct a problem with lift reversal in thick airfoil sections at low angles of attack. The double gurney flap reduces the control input required to transition from hover to forward flight. ^ Van Dam, C. P.; Yen, D. T.; Vijgen, P. (1999). "Gurney flap experiments on airfoil and wings". Journal of Aircraft. 36 (2): 484–486. doi:10.2514/2.2461. These devices provided an increased region of attached flow on a wing upper surface relative to the wing without the flaps. ^ Storms, B. L.; Jang, C. S. (1994). "Lift Enhancement of an Airfoil Using a Gurney Flap and Vortex Generators". Journal of Aircraft. 31 (3): 542–547. doi:10.2514/3.46528. One candidate technology is the Gurney flap, which consists of a small plate, on the order of 1–2% of the airfoil chord in height, located at the trailing edge perpendicular to the pressure side of the airfoil. ^ Giguere, P.; Lemay, J.; Dumas, G. (1995). "Gurney flap effects and scaling for low-speed airfoils". AIAA Applied Aerodynamics Conference, 13 th, San Diego, CA, Technical Papers. Pt. 2. pp. 966–976. through the proper use of Gurney flaps, the aerodynamic performance of a simple design, easy-to-build airfoil can be made practically as well as those of a modern, high performance, complex design. ^ a b c d Myose, R.; Papadakis, M.; Heron, I. (1998). "Gurney flap experiments on airfoils, wings, and reflection plane model". Journal of Aircraft. 35 (2): 206–211. doi:10.2514/2.2309. Race-car driver Dan Gurney used this flap to increase the downforce and, thus, the traction and potential cornering speeds generated by the inverted wings on his race cars. ^ a b Troolin, D. R.; Longmire, E. K.; Lai, W. T. (2006). "Time resolved PIV analysis of flow over a NACA 0015 airfoil with Gurney flap" (PDF). Experiments in Fluids. 41 (2): 241–254. Bibcode:2006ExFl...41..241T. doi:10.1007/s00348-006-0143-8. Retrieved 2007-07-07. ...the intermittent shedding of fluid recirculating in the cavity upstream of the flap, becomes more coherent with increasing angle of attack.... Comparison of flow around ‘filled’ and ‘open’ flap configurations suggested that [this] was responsible for a significant portion of the overall lift increment. ^ "The Gurney Flap – Dan Gurney's All American Racers". allamericanracers.com. Retrieved 23 April 2018. ^ SEAS. "Gurney Flap". www.formula1-dictionary.net. Retrieved 23 April 2018. ^ a b Jang, C. S.; Ross, J. C.; Cummings, R. M. (1998). "Numerical investigation of an airfoil with a Gurney flap". Aircraft Design. 1 (2): 75–88. doi:10.1016/S1369-8869(98)00010-X. Retrieved 2007-07-06. Liebeck stated that race car testing by Dan Gurney showed that the vehicle had increased cornering and straight-away speeds when the flap was installed on the rear wing. ^ Troolin,, Daniel R.; Ellen K. Longmire; Wing T. Lai (2006-06-26). "The Effect of Gurney Flap Height on Vortex Shedding Modes Behind Symmetric Airfoils". 13th Int. Symp. on Applications of Laser Techniques to Fluid Mechanics. Lisbon, Portugal. ^ Wagner, Jan R. (2004). "The 2004 Art Center Car Classic (Part Two): Dan Gurney on Racing and the "BLAT" Effect". Auto Matters. Retrieved 2007-07-06. And I remembered having spent a lot of time with these little tabs on the back, or spoilers and so forth, and I thought to myself – well, I wonder if one would work on a wing? We already had wings on these in 1971. Sure enough, that was the beginning of the Gurney flap. ^ a b c Howard, Keith (September 2000). "Gurney Flap". Motor Sport Magazine. Once Gurney had confirmed they were alone, Unser told him the rear was now so well planted that the car was pushing (understeering) badly, hence the poor lap times. ^ Unser, Bobby (2004). Winners Are Driven. New York: Wiley. p. 15. ISBN 0-471-64745-4. Dan told me to relax. Leave them in the open. Don't bring attention to them. ^ a b c d e f Houghton, E. (2003). Aerodynamics for Engineering Students. Boston: Butterworth Heinemann. pp. 500–502. ISBN 0-7506-5111-3. So successful was this deception that some of his competitors attached the tabs projecting downwards to better protect the hands. ^ Schatz, M.; Gunther, B.; Thiele, F. (2004). "Computational Modeling of the Unsteady Wake Behind Gurney Flaps". AIAA Paper. 2417. doi:10.2514/6.2004-2417. The first theoretical investigations were published by Liebeck who introduced the concept of trailing edge devices to aircraft aerodynamics. ^ Sobieczky, H. (2003). "Gurney Flaps in Transonic Flows". Iutam Symposium Transsonicum IV. Henning Rosemann and Kai Richter. Berlin: Springer. p. 165. ISBN 1-4020-1608-5. Gurney flaps are known already since 1931, when they were first patented by Zaparka (USA). ^ Gruschwitz, Eugen; Oskar Schrenk (1932-10-28). "Über eine einfache Möglichkeit zur Auftriebserhöhung von Tragflügeln (A simple method for increasing the lift of airplane wings by means of flaps)" (PDF). Zeitschrift für Flugtechnik und Motorluftschiffahrt. Wissenschaftliche Gesellschaft für Luftfahrt (21st 1932 Berlin). vol. 23, no. 20 (Translation by Dwight M. Miner ed.). Washington, June 1933: National Advisory Committee for Aeronautics. pp. 597–601. NACA-TM-714. The problem is to create, in landing, a region of turbulence on the lower side of the wing near the trailing edge by some obstacle to the air flow. ^ Jang, C. S.; Ross, J. C.; Cummings, R. M. (1992). "Computational evaluation of an airfoil with a Gurney flap". AIAA Paper: 92–2708. Retrieved 2007-07-07. ^ Bloy, A. W.; Tsioumanis, N.; Mellor, N. T. (1997). "Enhanced aerofoil performance using small trailing-edge flaps". Journal of Aircraft. 34 (4): 569–571. doi:10.2514/2.2210. ^ a b Meyer, R.; Hage, W.; Bechert, D. W. (2006). "Drag Reduction on Gurney Flaps by Three-Dimensional Modification". Journal of Aircraft. 43 (1): 132. doi:10.2514/1.14294. When hot-wire anemometry is used, a tonal component in the spectrum of the velocity fluctuations downstream of the Gurney flap is shown. This points to the existence of a von Kármán vortex street. ^ a b c Prouty, R. W. (2000-03-01). "Aerodynamics : The Gurney Flap, Part 2". Rotor & Wing. Access Intelligence. One of the critical flight conditions is a high-powered climb. The negative angle of attack of the horizontal stabilizer can be as high as −25°, whereas in autorotation it may be +15°. Wikimedia Commons has media related to Gurney flaps. Camocardi, Mauricio E. (26 April 2012). "Control de flujo sobre la estela cercana de perfiles aerodinámicos mediante la implementación de mini-flaps Gurney": 111. Retrieved 28 April 2014. This page was last edited on 28 March 2019, at 08:18 (UTC).